So how do tattooed bodies equate? Is this also a form of self harm? And plastic surgery? There is almost a artistic rhythm to this young woman’s self marking…. Always wondered where these two accepted permanent body changes fitted into the scheme. One of the problems in the study of self harm is everyone has their own theory. Lots of people have differing beliefs about the motives of self harm and when they find it they kind of stick to it and apply it to all who self harm. This can lead to mis communication and confusion amongst people who study this area or work with self harmers. “What do you get from self harming? It serves some psychological function for you, what is that?”. Some self harmers will be quite aware of this and answer the question easily. Others are not aware of their motives at all and it can take some time working with them to find out what are the psychological benefits to them from self harming. If you meet a therapist who says, the reason why people self harm is…. Don’t believe them! 1. Self harming as part of gang tattooing behaviour. 2. Self harming to make self feel real which can be found in those who dissociate. 3. Self harming to make self feel something. 4. Self harming used as a means of tension relief and to release pressure build up. 5. Self harming as a physical expression of emotional pain. Self harming is seen as providing concrete evidence of the pain. 6. Self harming as a means to self nurture. It allows the person to care for self as can be found in Munchausen Syndrome. 7. Self harming as a means to punish self and an expression of self hatred. 8. Self harming as a means to manipulate others or as a cry for help. As you indicate Karin this may have happened for this woman as there is a rhythmic quality to some of her scarring. She may have started as number 3 or 4 but as she continued it she discovered it became a type of body art or tattooing for her (#1). Hence we can see how she can have more than one motive and how the motives can change and transform over time. 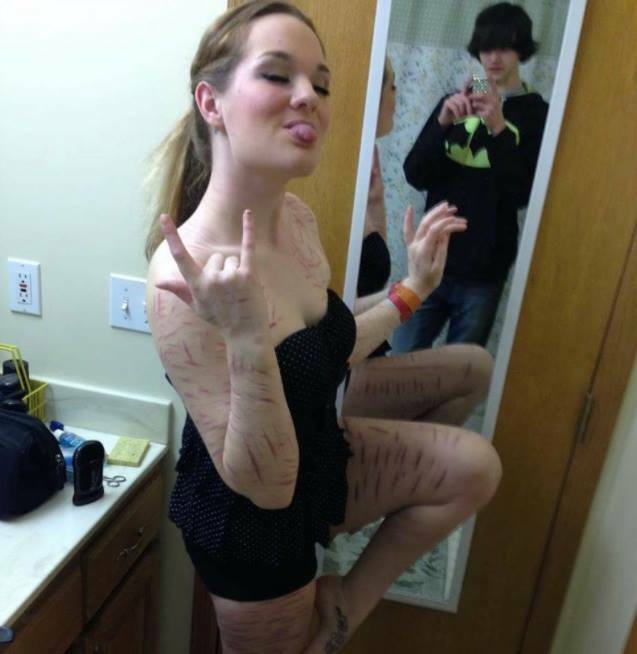 Why has she allowed her self harm to be photographed and why has she put it on the internet for all to see? To put this photograph out there could be an act of defiance. It is shoving quite an alarming image in the face of many people. She would know that she will get many a parental type of response. The Parent ego state of many people will spring into action as a consequence of her putting that photograph out in the public arena. That will range from the nurturing response of caring and concern to the Critical Parent response of, “Stop being an attention seeker, grow up and be responsible”. She knows she will get both types of responses as the photograph is quite alarming and the Child ego state of the observer will effected by it. Those with an active Parent ego state will then swing into action because the photograph has impacted their Child ego state. In addition to this her posture suggests a quite rebellious attitude. If this is so, then we may have discovered reason #9, a relationship based motive. Self harm as an expression of a high level of rebellion designed to elicit people to tell her stop so she can then defy them. (Similar to the motive one finds in some eating disorders). If this is so, and again it is guess work on my behalf, then we have an instance of multiple motives (3 at least) two of which may have evolved over time as she discovered the meaning self harm has for her and her psychological needs it can meet. In my view it is better to view self harm as a fluid, changing form of psychopathology rather than a static one reason form of pathology.